What age is it meant for? If you can run, you can play! The most common ages of our players are 8-14 but something we’re proud of is the way that multiple ages can play together. We’ve literally seen grandparents play with their grandchildren. It also works great for birthdays, family reunions, camps and icebreakers. It ranges from 2-20+, depending on the game chosen. 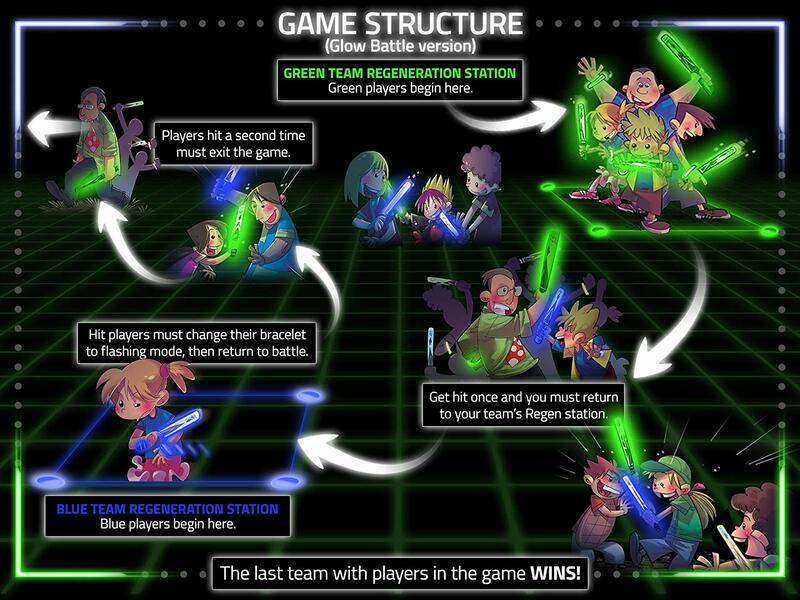 The “main” game “Glow Battle,” contains parts for up to ten players but Gladiator is perfect for as few as two. Thieves & Guards allows twenty or more people to play. As long as there’s space to run freely — and safely — there’s an opportunity to play this game. Backyards, parks, campgrounds: they all work. You also can play indoors with the lights off so long as the area is clear of obstructions. Indoor rec areas and gyms work especially well for this. All required batteries are included. Is it possible to replace the batteries? The lights will last at full intensity for 8-10 hours. After that, they continue to light up for another 24-36 hours but will grow more dim with time. Does it hurt to get hit? Not at all — though they do make a delightful SMACKING noise! Seriously, it doesn’t hurt to get hit. The bracelets are used to keep track of hits; they don’t actually register them. Every player begins the game with their bracelet in “solid” mode. After they are hit the first time, they must return to their team’s “Regeneration Station” (aka home base), then change their bracelets to strobe mode. If they get hit again, they’re out of the game for the round. The hits themselves are recognized using the honesty method. Although it doesn’t hurt, players KNOW when they’ve been hit. Sometimes a moderator is helpful, but for the most part we’ve found that people embrace the spirit of the game and are honest about keeping track of hits. What if a light isn’t working when I first get the game? The bracelets are too large. How do I adjust them? The bracelets contain small segmented grooves. You can easily trim them with scissors. Can I play this in snow? Yes, absolutely. While we don’t recommend submerging our game pieces in water, they are water resistant enough to set atop snow. The glowing lights against the white snow are really quite beautiful! Can I play this during the daytime? If you want to play during the day, we recommend finding a safe and spacious indoor area where you can turn off the lights (such as a gymnasium). That said, you can still play outside during the day — all the game pieces will still be visible and functional — it just won’t be as visually dynamic as at night. Hear it straight from the players themselves! Spent the whole evening running around and taking each other out. Was much better than dodgeball And way more interactive. Such great fun. We played with kids from 8 to 25 and they got along great. This summer, some of our grandkids (various ages) went out in our back yard to play “night games“. 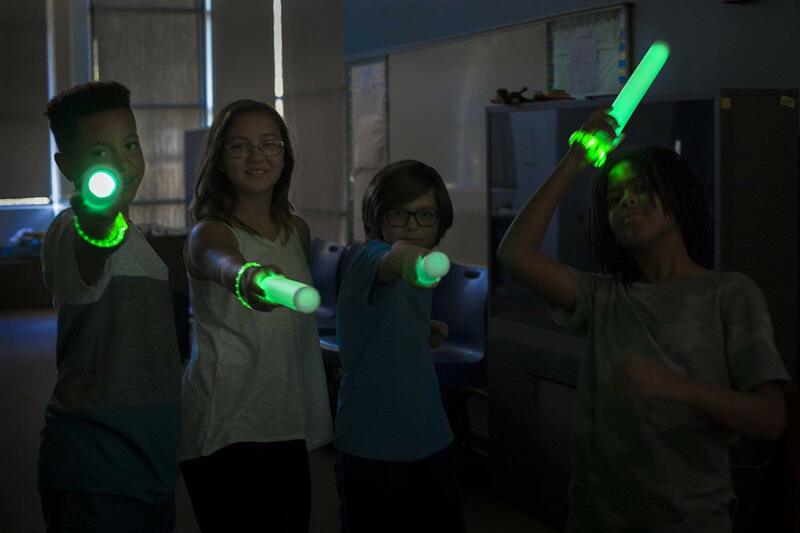 I whipped out my Glow Battle game. . Of course, they were super excited to try it out! For the next three hours we heard laughter, shouting, squealing! Needless to say, they absolutely did not want to quit! It’s so nice to have them out playing and running around together and having fun instead of staring at their electronics devices. Definitely a gift that keeps giving and that all Grandma and Grandpas should get for the grandkids !!! I was looking for something different to give my 9year old birthday girl. And this was perfect! Not only was it a creative, unique gift, but a gift that she can share with family, friends and the neighborhood. We decided to pull it out during her friend birthday party and it was a huge hit! Almost every parent asked where I got it. Thanks for helping get the kids outside and playing at 730pm on a dark, cold October night. They never felt the cold! This game has been a hit with our family. 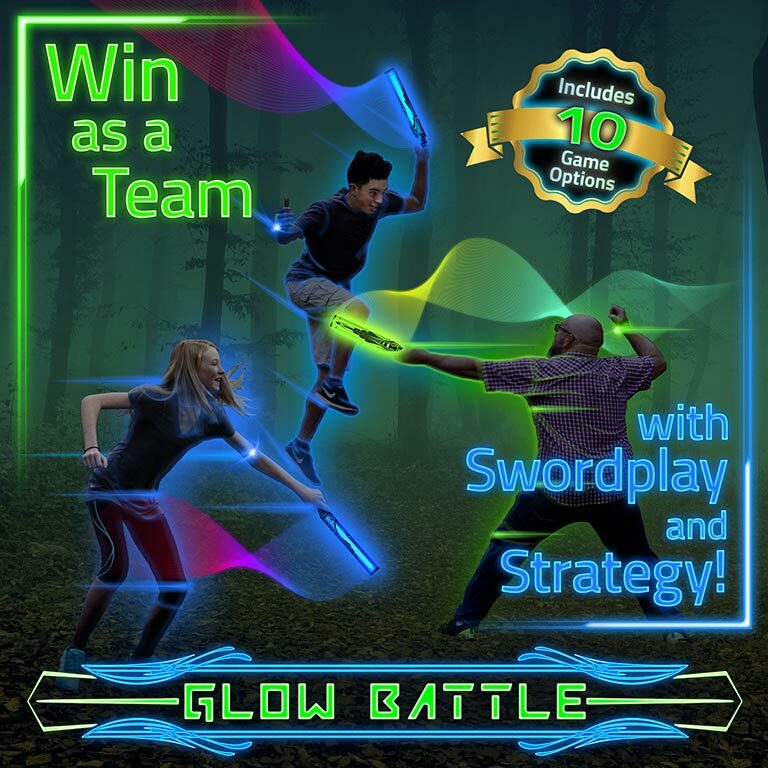 We were pretty active before ordering Glow Battle but some activities were not the most fun for each family member. But playing this game outdoors is a unanimous fun for each of us. It’s a great way to blow off steam and work up a sweat without having to climb on the boring treadmill too often! The kids needed some roughhousing since this generation is a bit soft lol. But it’s not too rough since the swords are made of foam! Great game. Good folks running the company. Try it and see if your fam gets off the couch a bit more often. Wherever I go, I see people sitting side by side, manipulating their phones. It’s especially disheartening when I see a family together where the parents and children are disconnected. This game, designed in its simplicity, breaks through the media barriers and brings family members into “contact” with each other. You see parents and children chasing each other, laughing together and just having fun together. This is a perfect gift for a family to give itself as a means to restore so much that is lost through media. It is money well worth spending. This game gave me and my friends hours of fun! The concept is simple, yet genius. After nightfall, the glowing parts really created a cool sci-fi action atmosphere. Also, we noticed that the sticks didn’t hurt at all, This was great, as it liberated us to really get after each other and get lost in the moment, without having to censor our actions. I was given this game as a gift and my 5 and 7 year old went nuts for this! Admittedly, they don’t do a good job sticking to the rules, but boy do they love fighting each other with these things. And I love that no one gets hurt. Such a great idea! Two thumbs up! The kids played a variety of different games tonight. I love that they are easy to set up and figure out. Everyone appreciates that! No one kid got hurt when they were hit with the weapons of light. TOTAL BONUS!!! 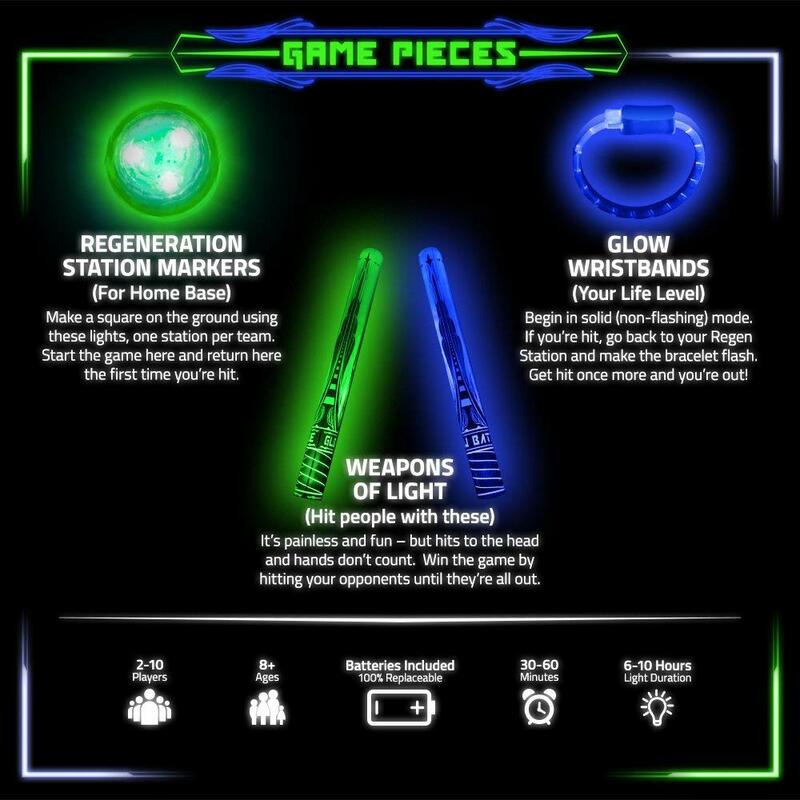 This is such a nice change compared to all the times over the years that my sons and their buddies have gotten hurt when getting hit with a light saber. Total joy kill!!! 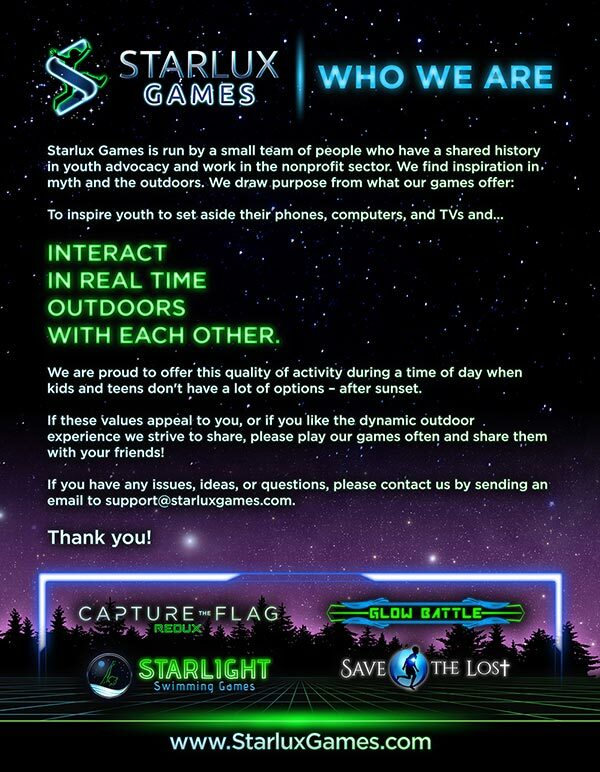 So glad to have a game that’s interactive and gets the kids outside, at night and that all age groups can play together. We look forward to lots more Glow Battles at our house!! As the mother of six very active kids, I’m always looking for constructive ways that they can expend energy. Glow Battle does just that. The great thing is that they can play Glow Battle in an open space inside, they can play in the backyard, they can play in the garage, and they can even play on the trampoline. Really, anywhere with some space. 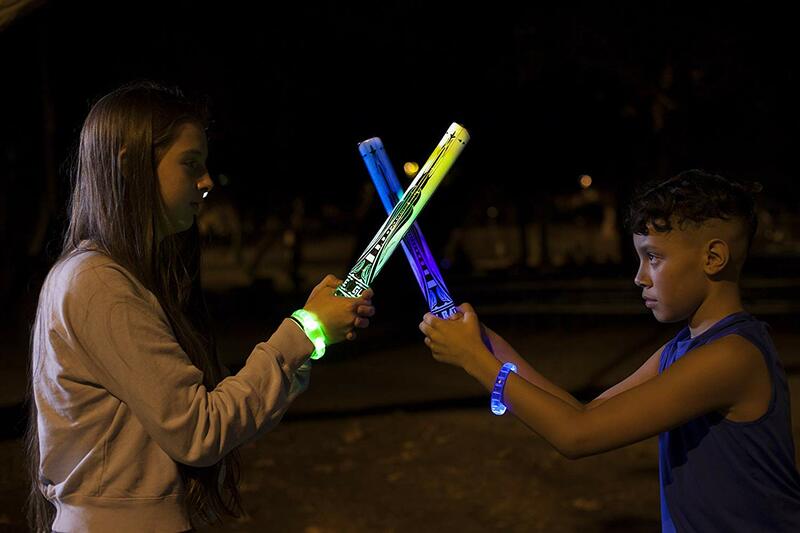 I thought they might get bored with it after playing a few times, but turns out that all-aged boys and girls really love to chase each other around with lighted batons in the dark for hours on end. Plus, it includes instructions for several game variations of strategy and teamwork that keep it fresh. And, all of the game pieces and batteries have withstood my crazy crew. 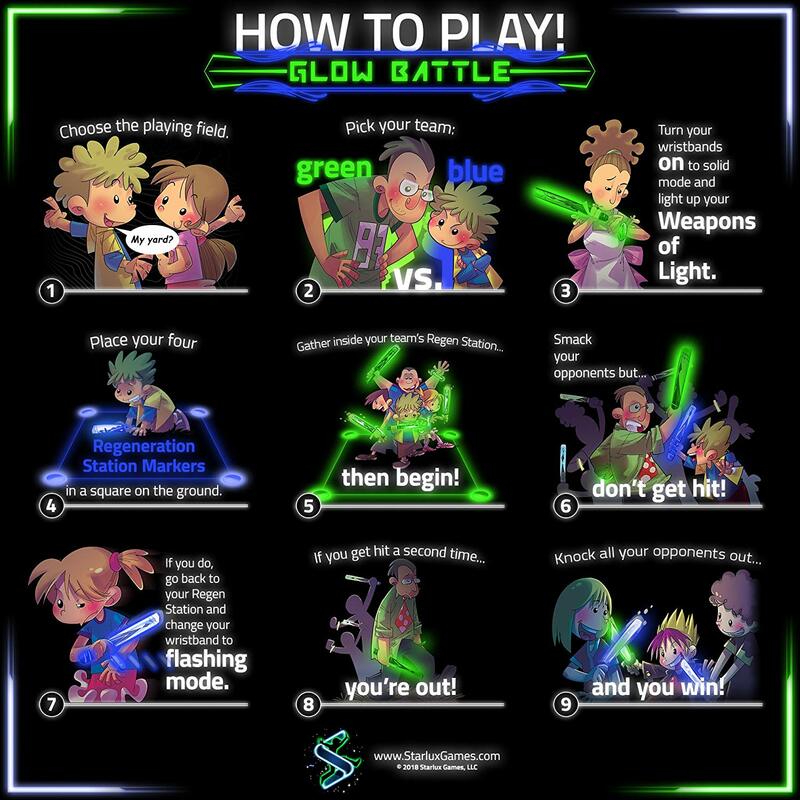 I think Glow Battle will make a fun Christmas gift for my friends that have kids, too. A few families and I played this randomly one night. Just decided to go to the park and try it out and hours later we were still having fun! Most of us “adults” pooped out pretty early-great exercise though-and the kids just kept going and going. They loved it so much and it was a great way to get everyone involved and safely playing after dark! The swords light up really well too and don’t hurt so even young kids could play. My kids like to play rough with each other so I was trying to find a game they could play together without getting hurt. They love glow in the dark things so I got them this game and they loved it. I thought maybe the wrap on the swords wouldn’t hold up to their play but it seems to be doing fine. They also have replaceable batteries which is great because some other light up toys I have don’t. Overall the kids enjoyed it and it was a good way to get rid of some of their energy without someone getting hurt.